Helene has 30+ years of professional experience working in corporate and small business environments'. She is well known in business circles in Kapiti-Horowhenua from her past role as the Business Development Manager at Nature Coast Enterprise. Her last significant corporate role in Wellington was as the Director Professional Development at the Institute of Chartered Accountants. This involved extensive change management and developing a business training model that ran at a national level and contributed significant turnover to the Institute’s budget. Helene is well connected, acts with integrity and is highly organised, motivated and positive. She will lead with purpose and action and loves helping others to make things happened. Helene is often asked for her opinion, referrals and to be part of local initiatives that are inspired around the growth and development of Kapiti from a business and community perspective. Every year she is involved in some way with Visa Wellington on a Plate. For the last four years she has run unique events (Ocean to Table Kapiti Style and Surf & Turf Kapiti Style) to showcase Kapiti food and beverage alongside PartyPerfect Catering. Helene & Jeanine (PartyPerfect Catering) are also partners and co-owners of the iconic Kapiti Food Fair. In 2016 Helene was appointed for a two year period to be on the Advisory Committee of Visa Wellington on a Plate. This Committee provides advice & acts as a sounding board for changes & new initiatives relating to Visa Wellington On a Plate. 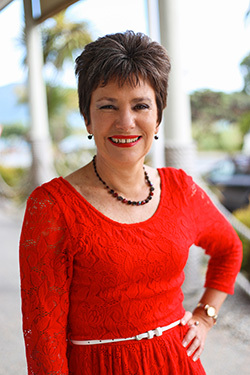 Helene is an active part of the planning group that facilitates Kapiti Women in Business, run under the umbrella of the Kapiti Coast Chamber of Commerce. Check out Women in Business in Kapiti. In June 2017 Helene was appointed to the Board of Kapiti Retirement Trust - one of Kapiti's largest employers. The Trust is Chaired by Norrey Simmons & other Board members are; John Irwin, Peter Kennedy, John Scutter, Mark Edgar & Steven Tomlinson. Wendy Huston is the CEO. The Trust has a long & outstanding history of operating a business model with a charitable purpose that benefits residents, not shareholders. It can achieve this charitable purpose by reinvesting funds from its commercial retirement village activity to provide a continuum of care for dementia, funded respite beds & end of life suite. Original generation time 0.9294 seconds. Cache Loaded in: 0.0174 seconds.